For many of my students the critical study of religion is new and unfamiliar terrain. On the one hand, it can be illuminating and exciting, even liberating, to realize that religion, in all its forms, is a product of its historical context. But it can also be challenging to negotiate the study of religion as an object of history without diminishing its aesthetic and theological significance. The critical study of religion draws on diverse linguistic, historical, comparative, and hermeneutical tools taken from multiple academic disciplines. Because the field of biblical studies touches on so many humanistic disciplines, and because many of my students have a personal religious investment in their studies, reading the Bible critically strikes at the very core of what it means to teach the humanities. My primary objective in undergraduate courses is to foster intellectual independence. To achieve this, students need to engage critically with the material, understand their own preconceived notions about religion, show a willingness to examine those assumptions critically, and be able to articulate and defend an argument that is well-reasoned and reflects their own thinking. Many of my classes are writing intensive. Through a variety of writing assignments students work on their analytical and rhetorical skills. On the undergraduate level I teach three different kinds of classes: (1) language classes (Hebrew and Aramaic/Syriac); (2) exegetical, i.e., text-based classes (on the Hebrew Bible/Old Testament, the Dead Sea Scrolls, and the Old Testament Pseudepigrapha); and (3) thematic classes (a class on Jerusalem that takes students to Jerusalem, on ancient historiography, apocalyptic thought and literature, and Jewish Messianism and Christian origins). Since coming to Rice I have won four undergraduate teaching awards, the Phi Beta Kappa Teaching Prize (2003), and the George R. Brown Award for Superior Teaching (2009, 2010, 2015). My colleague April DeConick and I have built a graduate program at Rice in Biblical Studies called The Bible and Beyond. The department's home page about Graduate Studies at Rice provides a wealth of information about our program as well as the other areas of concentration in the department. Our aim in working with graduate students is to train them to become independent researchers and successful teachers. A basic requirement for this is the acquisition of a set of skills that are fundamental to our discipline. 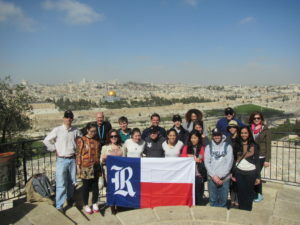 During their career as graduate students at Rice, students will become familiar with the history of the discipline, learn the historical-critical method of interpretation as well as other methods used in the field, gain linguistic proficiency in the relevant ancient languages, study and critically evaluate primary texts, and become conversant in the history and material culture of antiquity. I am the recipient of the Graduate Student Association Teaching/Mentoring Award (2015). I have enjoyed teaching a variety of courses in the community, in synagogues, churches, and in secular contexts, such as colleges and universities, museums (The Houston Museum of Natural Science and the Museum of Fine Arts Houston), and various community centers. As a public intellectual my primary aim is to create a meaningful link between cutting-edge scholarly research and the communities of faith.